Preheat your grill to its medium setting or prepare charcoals for grilling. Sprinkle the chicken liberally on both sides with garlic salt. Grill for 4-5 minute per side until lightly browned and cooked through. While the chicken is cooking, stir together the salsa, pineapple and ginger. Transfer to a serving bowl. Serve immediately, with salsa for spooning over the chicken. Short on time to plan a chicken dinner? I have a few secrets to share about how I turn a simple grilled chicken dinner into a fast, easy and flavorful dinner. Ready? Use thin-cut chicken breasts. 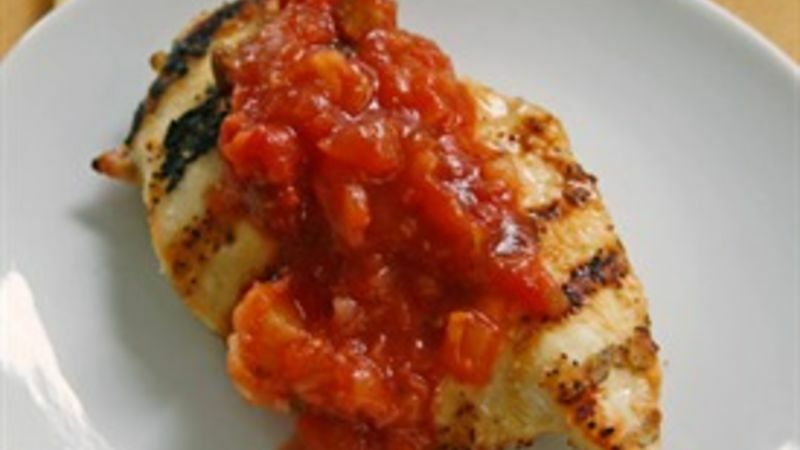 Available at most grocery stores, thin-cut chicken breasts cook faster and more evenly without losing their juiciness. If you can’t find them, pound chicken breasts out to ½-inch thickness. Skip the marinade and season instead. Marinating can take as little as 30 minutes or as much as overnight, and it produces a flavorful protein every time. However, when you want to get dinner on the table fast, stick to seasoning. Sometimes salt and pepper will suffice, but other times adding some chile powder, garlic powder or other seasonings can go a long way. Have a great topping ready. When you prepare chicken or anything else this way, it tends to be a little plain. But, that just means that it’s time to finish it with a great topping – grilled onions, relish or salsa can all work well. Now that you know the secrets to a fast, tasty grilled chicken dinner, let me introduce you to my Grilled Chicken with Pineapple Salsa recipe. It takes a mere 30 minutes to whip this up … and no one will ever know that you took a few shortcuts. The garlic salt gives the thin-cut chicken breasts tremendous flavor and goes so well with the pineapple salsa, which is given a boost with some fresh ginger. Love! Tired of the same ol' chicken meals? Try these chicken recipes for more easy chicken dinner ideas! Sarah W. Caron (aka scaron) is a food writer, editor and blogger who writes about family-friendly foods and raising a healthy family at Sarah’s Cucina Bella [LINK TO: http://sarahscucinabella.com].